It is Dog Jigsaw Puzzle for Kids in which one has to find the missing Jigsaw Piece. Solving this Jigsaw Puzzle will help you to improve your attention and flexibility of brain. In this Jigsaw Puzzle, one Jigsaw Piece is taken out from Photograph of Dogs. Your challenge is to find the correct Missing Jigsaw Piece from this photograph. Can you find this missing Jigsaw Piece? 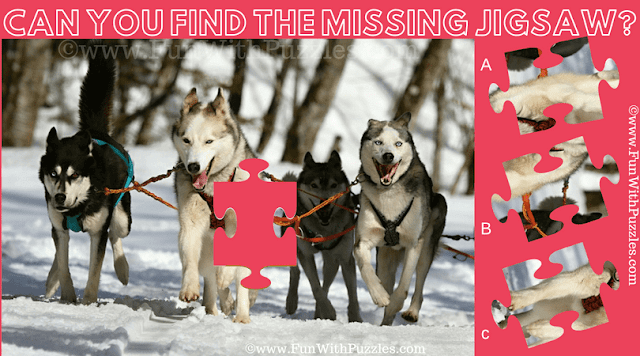 Can you solve this Dog Jigsaw Puzzle? Answer of this "Dog Jigsaw Puzzle for Kids", can be viewed by clicking on answer button. Please do give your best try before looking at the answer.